You can customise the welcome message and the support contact information for your organisation that users see when they first log in. To customize these messages, go to the admin area, and click Front Page Customization (under 'Global Settings' in the left navigation bar). 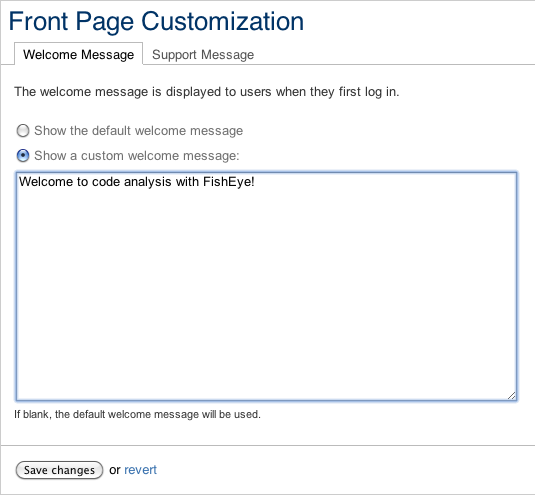 Click either of the Welcome Message or Support Message tabs, and then Show a custom... message. Enter your message text into the box. Click Save changes. Your changes are applied immediately. To revert to the default Welcome or Support messages, simply delete the text shown in the text box and click Save changes. You can directly edit the XML in the config.xml, located in your <FishEye install directory>.